We offer a large selection of socket adapters for various memory packages and types. If you need a specific socket that is not listed here, please contact us for a quote. Schematics are provided for most adapters if you are adventuous and want to make your own. (Type-A) 11.5mm by 14mm, 1.27mm pitch. Supports typical Series 28 and 29 devices. Rev. B includes VPP switch for legacy devices that need 12v for erasing or programming. DIP-32 Supports 32-pin 28 and 29 series and 3.3v or 5v. VPP switch with 12v option supported. (Type A) Supports devices such as AM29F080B and AM29F016D. SO-44 Fits standard SOP-44 (500 mil) devices. On board voltage circuit allows 3.3v, 5v, and 12v for VPP. Supports 28 and 29 series and 16-mbit and 32-mbit devices. (Type A) Supports standard NOR Flash devices. (Type B) Supports X8 NAND devices. For X16 support, only Mach1 is supported. See list below for supported devices. Supports newer 29 series Flash devices and densities up to 512Mb. (Type B) Supports older 28 Series Flash devices. See list below for compatibility list. 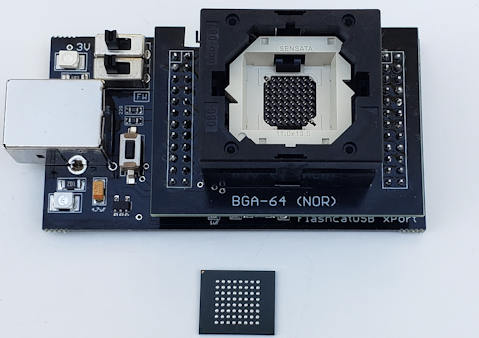 (Type-B) Supports older devices that use a non-standard pinout. (FWH) Supports Firmware Hub memory devices. Only compatible with the XPORT programmer. (Type B) Supports device such as AM29LV002, SST39VF016, S29AL032D. Supports SO32 flatpack devices, such as AS29F040 and WMF512K8.